Join us on Tuesday, April 16 at 7:00 p.m. in Room 102 of The Werf (aka VanderWerf) for the last colloquium of the semester. Professor Pearson will be presenting Euler’s solution to the Basel Problem, which asks the question, “What is the sum 1 + 1/4 + 1/9 + 1/16 + … ?” Professor Pearson will attempt to do justice to Euler’s remarkable genius in explaining his clever solution to this problem, and he will also discuss how this problem gave rise to one of the most important unsolved problems in mathematics today . . . and what all of this has to do with internet security. Students in Calc 2 or above will have studied the important background material for this talk, but students at all levels of math are invited to come and learn about this interesting story in the history of mathematics. 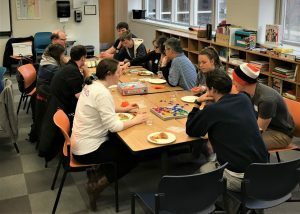 On April 1, the Math Department had its annual game and pizza night. 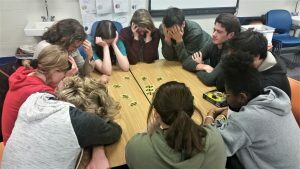 A number of new games made an appearance—one of them had players depicting increasingly complicated scenarios, another required the players to shut their eyes and listen to instructions from a phone app. 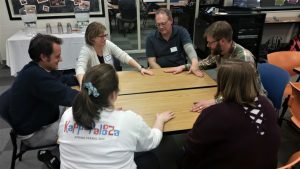 Someone also introduced a campfire game which involved the transmission of hand signals. Since the proportion of people who do not enjoy games and/or pizza is rather low, there’s a high probability that all those who attended had a good time. Pictures are below. 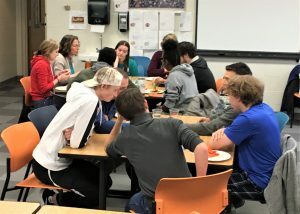 Eleni Persinger, a high school student from Saugatuck and Hope College mathematics student, has been accepted into the Stanford Pre-Collegiate Summer Institutes. This is a three-week summer residential program where students engage in single-subject intensive study. Eleni will be studying discrete mathematics. Besides discrete math, the institute also offers the mathematics of symmetry, number theory, cryptography, and knot theory as well as other science and non-science classes. Sarah Petersen, a 2017 Hope College graduate in mathematics and current graduate student at the University of Notre Dame received an honorable mention in this year’s prestigious National Science Foundation’s Graduate Research Fellowship Program. This program recognizes and supports outstanding graduate students in NSF-supported science, technology, engineering, and mathematics disciplines who are pursuing research-based graduate degrees. Sarah is working in the mathematics field of topology. Easter Sunday is still more than a week away, almost the end of the semester. Three years ago it was on March 27. Did you ever wonder how the date is determined? The easy answer is that Easter is the first Sunday after the first full moon on or after March 21. However, there is a more difficult mathematical answer to that question. In an old article written by Ian Stewart, Easter is a Quasicrystal, you can see the 10 steps needed to calculate the date of Easter for any given year. Congratulations to James Bird, Evan Bright, Anna Carlson, Jeremiah Casterline, Carolyn Coopker, Johnny DeMaagd, Christian Forester, Keegan Frisbie, Reilly Herman, Jacob Kowalski, Leah Krudy, Grant Lancaster, Peter Le, Libby McCormick, Gina Polito, Jack Radzville, Keon Rick, Jordyn Rioux, Rebecca Ruimveld, Mikaelah Snoap, Sean Traynor, Allison VanDam, Bethany VanHouten, Kimberly VanHouten, Kameron Wilcox, and Sunnie Zou — all of whom correctly solved the Problem of the Fortnight in the last issue of America’s premiere fortnightly mathematics department news blog. 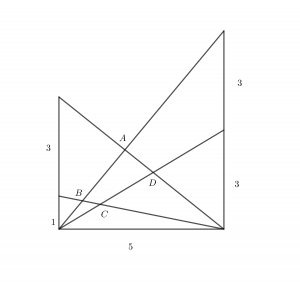 Find the area of quadrilateral ABCD, given that the vertical lines are perpendicular to the base and the distances are as given in the figure. Write your solution on a quadrilateral piece of paper of the same shape as ABCD and drop it in the Problem of the Fortnight slot outside Professor Mark Pearson’s office — room 212 in The Werf — by 3:00 p.m. on Friday, April 19. As always, be sure to include your name and the name(s) of your math professor(s) — e.g. Stew Dent, Dr. Dokter — on your solution. Good luck and have fun!